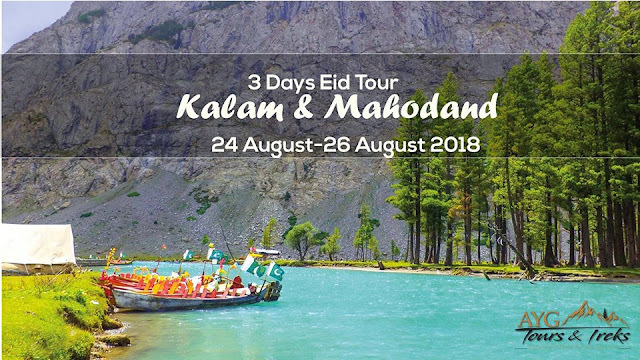 The charming Swat, a peaceful and fascinating tract in the lap of vegetative sky-high mountains, with eternal snow on their lofty crests, is an everlasting source of attraction for the visitors. Its beauty attracts tourists from all over the world to enjoy the soothing and serene sceneries, and the friendly behavior of its inhabitants. A visitor entered in Pakistan would never be contented without roaming about Swat. In eleventh century, Khwaja Ayyaz went on the Right Bank of Swat River and conquered the areas of Adenzee, Shamozee, Nekpikheil and so on. Mahmood went on the Left Bank of the river, when he reached Hudigram, there was the fort of Raja Gira, strongly built on a high peak. Mahmood commanded the conquest of this fort to an adroit general, Peer Khushal. The conquest of the fort was much more risky, but the order of the supreme commander was complied with. King of Kabul, Raja Alagh Baig, who was dethroned by his own tribe, called the help of Yousafzai to gain the imperial power of Afghanistan once again. All the chiefs, and Sardars of the Yousafzai came and supported him strongly. They fought a battle against Tajack, and Alagh Baig became the King of Kabul again. Since then, Yousafzai got an authoritative position in Kabul court and army. The Yousafzai tribe was settled there permanently. But as the king was a Tajack, his wife was Tajack, his friends, and his relatives, shortly all of the concerned people were Tajacks, so the men of his tribe confided him. They told the king that he would be afflicted by Yousafzai one day, because Yousafzai were not from his own race and all the key-posts were in their hands, therefore, they should be removed. Since then Alagh Baig schemed that the Yousafzai should be attacked at night while they are in sound sleep. His army did so, but the force of the king was defeated badly. When the elders of Yousafzai protested, the king cunningly expressed deep sorrows and assured them that some robbers might have taken the action. Alagh Baig now made another plan. He invited all the chiefs of Yousafzai and attacked them while they set to eat. All of the heads were killed, but only two of them, Sardar Malak Ahmed and Sheikh Malee, escaped. Both of the leaders migrated to Peshawar valley along with their tribe-men. Sheikh Mali distributed all the land among the male members of families of his tribe. According to this scheme, these families would change their villages after each decade, and the land of the new village would be distributed among the male family members. Finally, the land was allotted permanently under the auspices of Bacha Sahib within a period of five years i.e. from 1924 to 1929, and the nomadic life of the residence of this area came to an end.). Sheikh Malee introduced the units of land also. The smallest unit of land was Damray, while the largest unit was Rupee. Having no ruling authority, Swat was subjected to lawlessness and disorder. Internecine feuds were the common feature of this tract. When they were tired of mutual bloodshed, they wanted to choose an impartial man to solve their problems and disputes. For this purpose they called Syed Akbar Shah, but after ruling for five years he died. The next personality convened was Syed Abdul Jabbar Shah. He was a good scholar, and statesman with majestic port. But a well reputed learned man, Sandakay Mullah soon blamed him as Qadyani (a person having belief in the prophet-hood of Mirza Ghulam Amad Qadyani), and so Abdul Jabbar left Swat. In this connection, the other man was Miangul Abdul Wadood, the grandson of Mian Abdul Ghafoor (Sahib-e-Swat). The people entrusted Miangul Abdul Wadood with power in 1915 (But he was formally crowned in 1916 by the council (JARGA) of the chiefs of Swat in the grassy ground of Kabal). (He was the man of vigor and high determination. Formerly, he was the ruler of Swat valley only, but slowly and gradually, he expanded the border of Swat up to Gilgit. Later on he retired and his elder son, Miangul Abdul Haq Jehanzeb was crowned as the "Wali of Swat". Ruling time of Jehanzeb is considered as the golden period in the history of Swat. All of his reforms i.e. schools, colleges, hospitals, roads, and other communication system were matchless. There was a complete peace and order in Swat. But having the foresight of the future politics and the reaction of the nation, he gave up the ruling power in 1969. After the Wali regime, the officers/officials with no sense of possession, did not bother about the development of Swat with the required zeal and fervor. It not only halted the march to wards prosperity, but also took us to a very dismal state of affairs. The schools, roads, hospitals and the colleges of Swat were fully equipped with the latest trends. The Wali of Swat had plans to establish a university and professional colleges but the dreams remained unfulfilled due to the sudden turn of the table. His plans that soar high to the skies fell to the earth. The roads are no more useable. The schools and the hospitals have no proper system. The institutions have been destroyed, and every one devoid of high sense of national interest, is confined to the personal outlook and personal interests. This sad state of affairs if prolonged will further deteriorate the present infrastructure. This is an important point for us to know, why do we call 'Swat' to this tract, and from which source the name has been contrived. In the ancient history, the word 'Swat' is not found. The early peoples called this soil with various names, but not by the present name, Swat. For example, some three thousand years ago, it was called Udhyana (Garden). In the writings of Chinese travelers, we can find 'Soto', while in the accounts of Greeks, the "Asoconoi" has been mentioned, but Mahmood Ghaznavi has called it 'Qerat'. So for as the early names are concerned, Soto has much similarity to the present name. The second base for its nomenclature is of Arabic origin. It is said that the word 'Swat' is the distorted shape of Aswad (black). As the hills and mountains of this land are covered with thick forests, which appear in sight as black, therefore, it was called Aswad. Slowly, it became 'Swad' but latter on the name changed completely and the present name 'Swat' was composed. The final decision is lying in the fact that when Mahmood Ghaznavi conquered Swat, he wanted to settle some of his people to keep the control of the conquered area. So he settled two tribes the Swati and Dalazak here. As the Swati tribe was larger, the zone was called by the name of this tribe, Swat. 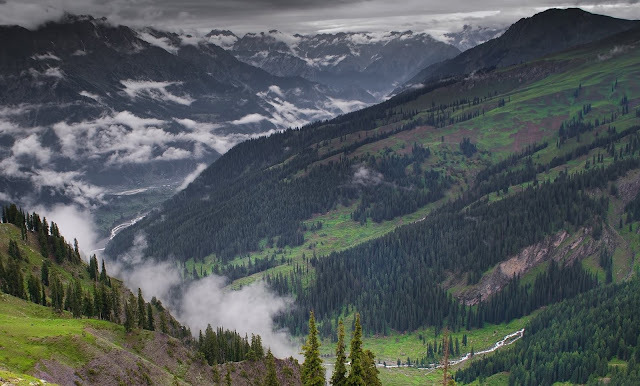 The valley of Swat is situated in the north of N.W.F.P, 35 North Latitude and 72 and 30 East Longitude, and is enclosed by the sky-high mountains. Chitral and Gilgit are situated in the north, Dir in the west, and Mardan in the south, while Indus separates it from Hazara in the east. 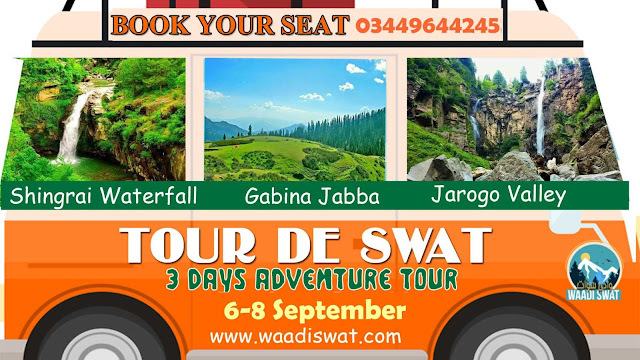 As mentioned above, Swat is lying in the lap of Mountainous Ranges, which are the offshoots of Hindukush, so the larger part of Swat is covered with high mountains and hills, the crests of which is hidden by everlasting snow. Though these gigantic Ranges run irregularly: some to the west while the others to the east, but the general direction is North-South. These ranges enclose small but very enchanting valleys. In Kohistan-e-Swat the chief knot of eastern ranges is Mankial. Its northern branches separate Kohistan-e-Swat from Abasin Kohistan. These ranges form a barrier between Gilgit and Swat, and between Chitral and Swat. The southern extension of Mankial ranges reaches proper Swat. There they join Shangla ranges. Shangla ranges separate proper Swat from Shangla Par area (Shangla Par district). In Shangla district, there are Karora Ranges, which separate Puran from Kanra and Ghurband. The continuation of Shangla ranges joins Dwasaray. On the one hand Dwasaray separates lower Swat from Puran, on the other, it set aside the Buner from Puran. Now the general Direction of the ranges turns westward. Here it is called Elum. Elum Ranges is a big wall between the proper Swat and Buner. The Elum ranges at last join mountains of Malakand. 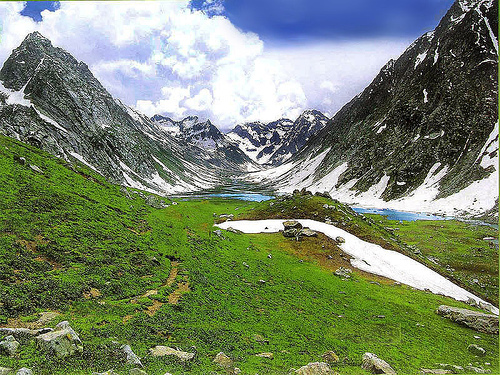 Western ranges start from the mountain and hills of Gabral, Kohistan-e-Swat. It joins the hills of Kundal (Utror). There these ranges meet Daral Ranges. These ranges form a border with Dir district. They run west ward and are named according to the locality. For example Lalko ranges Manrai and Chaprai etc. at last they join the hills of Adenzee and Shamozee. Manrai ranges send off some off shoots southward. They the hills separate Arnoyay valley from the widest valley of Nekpikheil valley. In Buner, there are many ranges of hills. Some of these hills run east west while others north south. For example Ambela Ranges form a border between Sodam Rustam (Mardan) and Kawga. Again, there are some ranges, which separates the surrounding areas of Kawga from Chinglai. The pass through these ranges is known as "Doormai Kandaw". There come other ranges. These are the hills of Dambara. So it is hard to count the actual number of the hills and ranges, but this is a fact that the major portion of Buner district is covered with hills. Though, these hills are not as high as hills of Kohistan-e-Swat, yet they enclose many small charming valleys and are more populated. In the armpits of these mountains and hills there are small beautiful valleys, which are praiseworthy, these are limited to the watercourses of local rivers. The hills or mountains no doubt, enclose these valleys, but the local people have connected them by narrow path through high passes. These mountain ranges have some high peaks, which are capped with everlasting snow. In the north of Mankial Ranges, Falakseir is a well-known peak with a height of 19415 ft above the sea level. 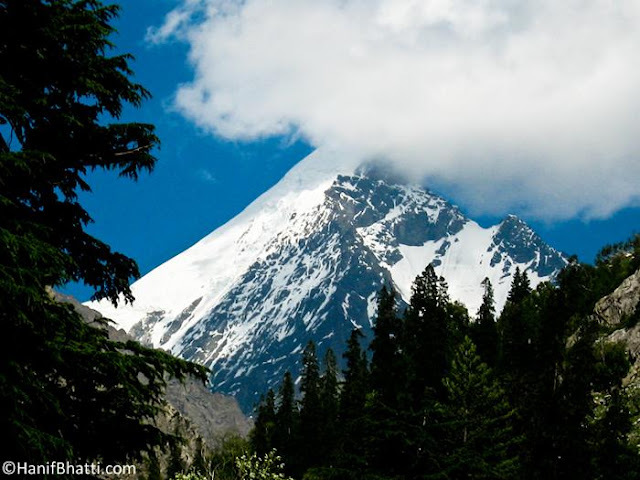 Chokail is another sky-high peak in the same ranges, which lies to the south of Falakseir. The height of this peak is 20528 ft. The third one is Mount Mankial in the vicinity of Chokail. This mount is 18338 ft high above sea level. An explorer submerged in the snow while he tried to conquer them. However, a Japanese adventurer conquered mount Mankial in 1975. In these high ranges there are lakes, known as Dand. In Ushu the famous lake is Mahodand (the lake of the fish). In the eastern ranges, the other famous Dand is Bashigram Dand. Though, there are many Dands but Bashigram Dand is very charming. It seems that this Dand have been made by some gigantic creatures, and all the big blocks have been prepared very carefully by the sculptor and have been placed skillfully. 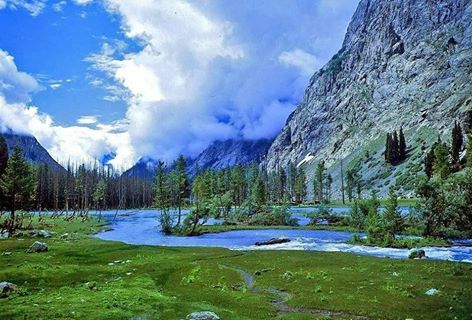 The natural scene of this Dand is so charming that the ex-ruler of Swat has visited it thrice. This Dand is one of the sources of Bashigram River. The western ranges, Daral Ranges, have also three big Dands. Two of them lie in the area of Swat, while the third one is in the boundary of DIR. The Dand of Kundal is the largest of all the Dands of these ranges. It is rather a tiny sea surrounded by the high peaks with murmuring rills. In the vicinity of this biggest Dand there are two small Dands, one is called Khaperai Dand (fairy Dand) and the next is the Dand of Speen Khwar. This Dand is so charming that the ex-president of Pakistan, Farooq Ahmad Khan Laghari came here by helicopter to enjoy the enchanting scene of this Dand. Seidgai Dand is second in size, but it lies out of the borders (watershed) of Swat. It is situated at the terminal of Wosheray Dara, Dir. It is mentioned here, because, the pastures of this area are hired by shepherds of Swat. The Dand of Daral is third in size, which is the smallest one among the big Dands. These Dands feed rivers. For example, Daral Dand feeds Daral River, which joins Swat River in Bahrain. These ranges have good pastures, generally, the areas in the vicinity of a Dand is used as a pasture. These pastures are very charming. The land surface is covered with green grass. The grazing cattle, goats, sheep, cows, horses and even the buffaloes on the slopes seem very charming. Some of the famous pastures are Mair, Tolay, Jamdarai, Seidgai, Tharkana, Kar Banda, Chamber, Jaba, Kundal, Batal, Lado Banda, Loi Pandghalay etc. These pastures are lying in the knot of Daral. Moreover, each Spinsar (denude mount) has pastures. For example, Bashigram Pasture, and the pasture of Ajmair are at such a height that the rock is denuded, and have no soil. Actually the valley of Swat starts from the foothill of Malakand but we are concerned with portion from Landakay to Gabral (Gulabad), the area within the administrative boundaries of Swat. The length of the valley from Landakay to Gabral is 91 miles. Two narrow strips of plains run along the banks of Swat River from Landakay to Madyan. Beyond Madyan in Kohistan-e-Swat, the plan is too little to be mentioned. So for as the width concerns, it is not similar, it varies from place to place. We can say that the average width is 5 miles. The widest portion of the valley is between Barikot and Khwazakheila. The widest view point and the charming sight where a major portion of the valley is seen is at Gulibagh on main road, which leads to Madyan. There are some subsidiary valleys, which help to increase the width of the main valley. These subsidiary valleys are called "Daras". A Dara a narrow passage between mountains, and sometimes, the upper course of a river is also called Dara. If we imagine the main valley as a stem of a tree the subsidiary valleys form its branches. Swat River and its tributaries drain Swat. There fore, the whole valley is the outcome of running water. This flowing water cuts the upper courses deeply, and flows the load of washed away materials. As the gradient is greater in the upper course so the erosion is on large scale, particularly in the summer rains, when all the rivers are in flood. The big boulders and stones are rolled, which causes more destruction in the upper courses. When the loaded water reaches to the areas of low gradient, the heavier materials are deposited. The deposition takes place according to the slope, generally, we observe, that the upper course is made up of big boulders, the middle course is of relatively small stones, pebbles, and debris, while the lower course is made of fine clay. Anyhow, the whole plain of Swat valley is strewn by the running water, and is made up of fine alluvial soil. The lower Buner, Chamla, starts from Ambela Kandaw and reaches to Swabi. We can find plain areas in Upper Buner like Jowar, Anghapur, and Swarai up to Budal, and in Lower Buner or Chamla: Chinglai and Khadukheil. The area of Kawga, Nawagai, and Sora may be grouped as plain to some extent. As many of the rivers in Buner are inundation or rainy rivers, and their upper courses are short, therefore, the deposition of clay is started just at the foot of the hills. This is because the whole surface of Buner Plain is made of clayey materials. The thickness of the layer of clay is greater here. Swat is lying in the Temperate Zone in the northern mountainous ranges of the Indo-Pak Sub-Continent, therefore, here weather is affected by all the climatic factors "latitude, altitude and rain bearing winds" (the cyclone and monsoon winds). In summer, Swat comes under the influence of the monsoon, while in winter, it is affected by the Cyclonic Current from the Mediterranean Sea. So for the temperature is concerned, the height of Swat varies from 2500 ft to 7500 ft, therefore, this is colder zone. Due to the absence of meteorological department, we cannot quote the actual recorded data; anyhow, January is the coldest month of the year. The temperature, generally, remains between 40 F and 45 F (2 C to -2 C). The water-freezing season is from the last week of December to the end of February. In mountainous areas it takes more than three months. The hottest month is July, in which the temperature rises to more than 90 F (32 C) in the plains, but in mountainous areas, it is lower. In Buner, however, we find a little bit extremity of weather. The rains from March to May are regarded as the spring rains. In this season, the rainfall occurs in shower with thunder and lightening, and the drops are bigger. The lengthened period of the continuation of the spring rains is destructive for the muddy homes of the poor villagers. Usually, there is a gap of one dry month, June, between the rains of spring and summer. The summer rains begin in July, and end in September. These rains are not so continuous. They are in intermittent position. Sometimes the rainfall takes place suddenly with hailstones, which results in the damages to property and lives. The rain of this season falls with shower and lightning. The annual rainfall is about 50 inch. The general effects of the weather condition are cold winter and warm summer, and the coldest winter in mountainous areas. The amount of rainfall and temperature is enough for the growth of vegetation. The naturally growing plants can be grouped into two types because there is difference of conditions between the plain and mountains. In the lowland of Swat, the temperature is comparatively high, so the plants and trees are of broad leaves deciduous type. Poplar, Bakyan and Willow are the common non-fruit trees. The mulberry, pear, apricot, plum, damson, walnut, apple, fig, grapes, orange, jujube are fruit trees, and grow everywhere. Acacia and olive are also found in gregarious positions. The local names of some of plants and shrubs are Kharawa, Manrogaya, Kwarae, Manro, Soorazghi, Ghorashki, Khonawli, etc. The plants and shrubs cover the slopes of the hills and the foothill areas. Beyond the height of 4500 ft, there are vast amounts of forests of coniferous trees that consist of Pines, Dewdar, Cedar, Byar etc. Generally, each of the variety forms its own belt. Mostly, the lower belt is of pine. The next to come is Dewdar and Byar. The belts of these two varieties reach to the denuded mounts (Spincers). The pine and spruce are found even in Buner, where the height is not much greater. But Dewdar, and Byar, grow at sufficient height and are found at Kohistan. Among the shrub, Borajae, Bang-e-Dewana, Ghanamrangae and Shangla are grown on the slopes of the hills and mountains. Shepherds, nomads (the local name of them is Ajar) are migrating to the hills along with their flocks, where the growth of the grass is greater. These areas are considered as permanent pastures. Caraway seeds and mushrooms are also found in the same areas when snow melts away. The vegetation of Swat has a great value, particularly, the forests and grass. Dewdar and Byar grow in vast amount in the upper belt of forests. Wood taken from them is durable and is not rotten easily even in the water, therefore, they are used in underwater constructions and buildings. Pine is another useful wood for timber, beams, rafts, and furniture. Generally, furniture is made of Walnut, Bakayan and Poplar. Due to these forests, woodcutting is a common profession for the local people. They also get a meager amount as royalty from the government. The shrub and grass provides good pastures for the cattle. Gujars and Ajars drive buffalo, cows, sheep and goats to these pastures, in summer season. The local people call these pastures Banday. Formerly, the nomad were paying a great amount of money to the Khans, who considered themselves as the "Masters" of both the plains and the hills, but now, the Ajars and Gujars ceased many of these pastures and they do not give anything as lease. The Khans did not satisfy only with the money paid to them, so the poor Ajars and Gujars also had to pay butter oil, ghee, fuels, and wool. Some people collect mushrooms in these forests, and sell them with high prices. Moreover, resin is also obtained from the trees of pine. The final and greater importance of all these vegetation is to protect soil erosion. Human life is impossible without agriculture; industrially advanced areas depend on it indirectly while the rural settlement is directly benefited with this profession. So far as Swat concerns, about 99% of the population are cultivators. With the exception of a few, all the landowners have small tracks of land. These holdings are so small that the holders are not only landlords but they are peasants too. The ever increasing demands for daily life compels the poor peasants to get more and more yields of the tiny tracts of soil. So they use various techniques and chemical fertilizers with the addition of cattle dung in large scale. The barren soils are made arable, the narrow farms where the plough cannot be used, are tilted by mattocks, the week soils are deprived of yearly rest, one cropped areas converted into two crop areas, and single crop farms changed into orchards. In the hilly areas, huge walls have been constructed to make farms on the slopes. The advantage of these walls is to protect the fertility of the soil and hinder erosion. In spite of this hard work, the poor peasants can not get enough yields to suffice for their livelihood. 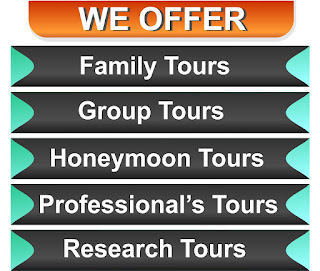 Therefore some of the members of the family migrate to large cities for services to earn much money to meet their needs. The individual holdings have been subdivided and a single owner has parts of his holdings in various places of the village. For example, a holder of an acre land has parts of that one-acre in different places, therefore, the farmers cannot serve them properly. The next item responsible for low production is irregular irrigation system. Vast areas in Swat solely depend upon rainfalls. The peasants sow the seeds in the hope of rain, but when, unfortunately, the rain misses time, the seeds are either rotten in soil or picked up by birds, ants, and other insects. If it rains, sometimes, the rainy streams become so overflowed that the surplus water gushes in the newly sown or newly grown fields and a layer of debris is deposited over them. So both the seeds and the newly germinated plants are spoiled out. The cattle dung was used as fertilizer some years ago. Now the position has changed. Dung is no more used as manure but rather as fuel. It has also affected the production, the farmers try to get the best type of fertilizers but they are not given it easily by the government. Therefore, many of the weak farms are given seasonal or yearly rest to obtain the energy from the natural sources. Moreover, the prices of fertilizers are so high that the farmers are about to give up their use. The poor and hard working peasants want to make the barren soil on the slopes of the hills clean and arable. But the Khans and other lords prevent them to do so because they claim that the hills and mountains of Swat are their belongings. The final factor responsible for the low agricultural production is limited to the proper valley of Swat only. As the Swat river is not channelized so its unchecked flow causes to wash away vast cultivated areas every year and deprives the poor peasants from their land tracts. The ex-Wali was to channelize the water of this river, but unfortunately his dream was not realised and Swat absorbed in Pakistan. This harvest is called Rabee in other parts of Pakistan, but its name in Swat is "Har". It starts from September-October, and lasts till May and June. The chief crops of this season are wheat, barley, mustard, and lentil. Wheat is the staple food all over the region. It is grown in the whole district. Only in a few mountainous areas where the temperature is sufficiently low and snowfall is greater, wheat cannot grow. Because the required heat to ripe the crop is not available. Moreover, soil of Swat is composed of the rotten leaves of trees and shrubs with the mixture of other suitable organs, so this is very productive and favors the growth of wheat. Wheat is grown in the valley of Swat and Buner. In Kanra and Ghurband it is little, and in Kohistan, the cultivation of this crop is negligible. The cultivation of wheat is common in Swat but due to the rough methods of cultivation, the per acre yield is very low. In early days, there were two varieties of wheat, Shargha and Kundyan. Shargha was of thorny ears while Kundyan had no thorns. The stalks of Shargha were smaller than Kundyan. The breads of these were very delicious, and they also produced more husks for cattle, but the yield was little. As the output of the above mentioned varieties was low, these were replaced by "Maxipak". This variety was good for output but, generally, the farmers suffered from shortage of husks, therefore, the peasants were not satisfied with this variety. Presently, agriculture department has introduced many new varieties for example Pirsabak-90-85, Inqilab, Pasban, etc. Barley was a staple food grain in Swat some 30 years ago among the poor peasants. The ladies were so expert in backing the breads of barley that it was preferred to wheat. But the procedure was very difficult. Secondly, barley was also cleaned from chaff and was cooked as rice in cooking pot. It was called Batey. At morning Batey was mixed with buttermilk and was used for breakfast. This mixture was called Ogra (Ogra is also made of rice). Among the oilseeds mustard is a common one. It has a couple of advantages: firstly, it produces the seeds for oil, secondly it makes the soil fertile. The farmers sow it to prepare the fields to grow more wheat for the next year. The mustard is sown in the rainy soil. it is sown, particularly, in Nekpikheil, Shamozee and Shamizee. In the early spring, in the end of February, the green surface marked with golden strips excites the hearts, and presents the loveliest scene ever present on the earth for the lover of nature. The yield is low. The farmers sow this crop for their personal use. Other crops of this season are lentils and peas. They are produced for the personal use of the farmers. This harvest is known as "Kharif Crops", but in Swat, it is known as "Manay". The crops of this season are sown in June-July, and harvested in September-October. The chief crops of this season are maize, rice and jute. Maize is a staple food in the Swat and is grown wherever the agricultural activities are carried on. Because the favorable climatic and soil condition are available. The maize is grown in higher places also, where wheat cannot thrive best. The distribution of its growth depends upon the variety of the corn and supply of water. Some of the varieties require much water while other do not. 1. Lapsatee. 2. Ghundyan. 3. Woorakyan. Rice is another food crop of autumnal harvest. The required geographical environment is available in Swat. The abundant supply of water, temperature, and soil condition are favorable for the growth of paddy. About 15 years ago there were three varieties: Shooga, Garra, and Lawangai. They were very delicious in taste, (especially, Lawangai had a very fantastic smell also, and the grains were very thin). The grains of Shooga and Garra were fat, and there were some reddish and greenish grains too. These kinds of rice changed because they could subjected to diseases easily. The alternates of these are Begamai, Sela, and Shpetamai. Now, Begamai has got a good position among the rice varieties. Rice is grown in the valleys of Swat River, and its tributaries. In Buner, the Valley of Barandu grows rice. It is also grown in Makhuzee, Puran, in some parts of Ghurband, but the production is satisfactory only in the proper valley of Swat River. The other areas produce rice on such a low scale that it cannot satisfy the local need. The other productions of this harvest are roping-hemp and beans. Generally a rural population tries to produce the items of daily use themselves. Similarly, the peasants of Swat grow various kinds of pulses, and vegetables. Some of them are tomato, potato, turnip, pumpkin, okra, radish, carrot, chili, spinach, cauliflower, cabbage, garlic, onion and mint etc. A variety of vegetables produced in hilly areas is known as Samchal, Shella and Kwanjay. Among the pulses lentils and peas are common. The surplus amount of the food grains come first in this respect. However, the particular crops are tobacco, hemp, and sunflower. Tomatoes and potatoes are essential element in the commercial field of Swat: Both of the items were growing for the personal use of the farmers about ten years ago. In 1963, there were a few small tracts, which were tilted for potatoes in Utror, Kohistan-e-Swat. Now, whole of Kohistan-e-Swat (from Bahrain to Gulabad, and Ushu,) beyond the glacier of Matiltan, produces heavy output of potatoes. The Government preserves them for seed purposes. The quality of the potatoes is the best, the yield is very high, and the size is very large. Like potatoes, tomatoes have also made progress in a few years. It is grown in the valleys of Swat River and its tributaries. Vast areas have been made up for the gardens of tomatoes. This crop thrives best in the valleys, and produces an ideal yield. However when the summer rains are in excess, the plants and flowers are damaged, and the yield decreases considerably. Both, potatoes and tomatoes, are sold directly in the markets of Peshawar, Rawalpindi, and Lahore. Cultivation of potatoes on large scale is limited to Kohistan-e-Swat, while tomatoes are grown in the proper valley of Swat. In Buner, Chagharzee, and in Shangla Par, both crops are produced but little. The onion is planted in Swat Valley (from Landakay to Madyan). The production not only suffices the local needs, but is transported to other parts of the country also. This vegetable is produced on larger scale in Shangla Par and in the hilly areas of Swat, and is transported to other parts. The geographical conditions are available for sugarcane, and it thrived successfully in Swat. Some years ago, large tracts had been brought under the cultivation of this crop, but the preparation of Gur (dried molasses), was not profitable. Therefore, the farmers gave up its cultivation. However, in Shamozee (lower Swat), and in Gadezee (Upper Buner), sugarcane is grown, gins have been installed for crushing it in these areas, and Gur is prepared. The Gur of Shamozee is very famous, and is sold like hot cakes. In Buner, it is prepared only for the personal use of the farmers, but in Shamozee, it is produced on commercial bases. Tobacco is planted in lower Buner and in some location of Western Chagharzee for Naswar (, a mixture of tobacco powder and ash or lime) only, and its cultivation on commercial scale is rare. Melons are also cultivated in Swat, but they are not very delicious. The watermelons are good here, but its gardening is rare. This commodity came very fresh to the group of cash crops in Swat. This is experienced in Shamizee. The expectation for the increase of this crop is greater. Regarding fruits, Swat is a lucky district. It grows various kinds of fruits. Generally, citrus fruits are grown here. Some years ago, when the artificial methods of fruit plantation were unfamiliar, the naturally grown fruits were abundant. But the trees of the fruits were scattered and were not in gregarious position. Since the inhabitants of the district took interest in this aspect of agriculture, vast tracts of soil were brought under the plantation of fruit trees. The farmers got skilled in horticulture, and they knew how to graft various trees. So, slowly and gradually, orchards appeared in the field of agriculture. Many of the wild fruit trees advanced artificially, and became more productive. Yet some of them: Walnut, Jujube, Fig, etc. are totally neglected. In Chagharzee, Puran, and Makhuzee, a variety of figs, known as "Wormal" (a fruit equal in size of an apple), is grown. This fruit is unfamiliar in the markets of Swat. The horticulture started first in Matta Sub-division (Upper Swat) on commercial scale, therefore, this zone is very advanced now. The main item of the orchards is apple, though other fruits like damson, grapes, pears, loquat, apricots, and prune etc. are also planted, but they are on small scales. These orchards earn more money for the owners. Some of the famous orchards in Upper Swat are at Kooz Sherpalam, Bar Sherpalam, Matta, Jora, Shanguatai, Arkot, Biakan, and Ronyal. There are large and vast gardens in Jankikhel. The eastern bank of Swat River is also covered with gardens. Moreover, there are many tracts, which are not counted as orchards, because they are smaller in size and area. Most of the gardens are freshly planted. Seeing this high income, many farmers changed their cropped areas into orchards, and now there is a strong competition of this profession, so strong that the yield of food crops decreased to formidable extent. In Babozee Sub-division, the orchards are different to those of Matta. The orchards are multi fruit gardens here. Orange, loquat, pear, damson, peach, apricot etc. have been planted here, but the chief item of these orchards is orange. The largest fruit gardens are in Barikot. In Shangla Par, the walnut, mulberry, pears, and grapes grow well, but due to the unsuitable transport system, attention has not been given to horticulture. Buner does not take much interest in horticulture, because supply of water is not permanent here to meet the needs of gardens. The horticulture is increasing with the introduction of tube-wells. In Kohistan-e-Swat, Utror is the chief producer of apples. Animal rearing is an integral part of agriculture, as the bulls plough the fields, and buffaloes, cows, and goats give milk, curd, buttermilk, ghee, and meat. The sheep provide wool for blankets. Moreover, the dung of these animals is used as manure, and fuels. The skins are used for shoes making purposes (Some people also make cards of it for the texture of cots). The rural cattle include those quadrupeds that are being kept by the peasants for their personal use. Bulls, buffaloes, and cows are the common among them. The sheep and goats are reared too, but not with much interest. The cattle are fed husks, grass, and Shawtal (a kind of green grass). In winter, when there is not green grass, the dry grass, the husks, paddy, and dry plants of maize are fed to them. Gujars are called those nomads who keep buffaloes and cows. As buffaloes and cows are heavy animals, so they cannot be driven easily to the pastures ("Bandas"). So, they settled in the suitable environment, and started peasantry life with their old profession of rearing the cattle of big animals. However, the Gugers who keep continued the seasonal migration are called Bandars. Ajars are those nomads who keep sheep, and goats. A poor Ajar has cattle more than five hundred sheep and goats. In summer, May and June, when the spring is in full bloom at the pastures, the atmosphere is fragrant, and environment is peaceful, each family of Ajar migrate to their pasture known as "Banda". They stay there with a happiest life, and graze their cattle with much interest. In spite of the hard transportation of foodstuff to these pastures, the Ajars become very polite and hospitable here. After staying there for about four months, they commence again their journey downwards, and drive their streaming flocks to the plain areas in September-October. They seek shelter from the severity of harsh weather conditions by migrating to comparatively warmer situations, where they can graze their flock easily. So, many of them go to Buner. The source of the income of Ajars is their cattle. They sell wool, hairs of goats, butter oil, hides, and the sheep, and goats, and earn their livelihood. The beasts of burden kept in Swat are mules, donkeys, and ponies. Some of the farmers keep only donkeys for their own needs. So far as the live stock concerns, it decreases gradually. This is due to the fact that the grazing land is shrinking. In the early times, the farmers were giving either yearly or seasonally rest to the fields. But now, the fallow lands are unavailable. This shortage of open fields caused the decrease of rural cattle. In Swat, every farmer has enough hens to meet his own needs. So for as the commerce is concerned, much attention has been given to this profession. Now there are many poultry farms: About each large village have at least one poultry form. Chickens, particularly capon, are available everywhere in abundance. In early days when the shrubs and bushes covered slopes and foothill areas, the rabbits, porcupine, fox, jackal, wolf, pigs, and hyenas were in large number. Now the need for fuels decreased the scrubs and trees, so these animals have decreased considerably. In the forests, lions, tigers, bears, and monkeys are found. Among the birds: hawks, eagles, falcons are found in the high mountains, while pheasants, partridges, hoopoes, larks, sparrows, quails, doves, swallows, starlings, nightingales, crows, kites, vultures, owls, bates are the common birds. The bees were kept in Swat commonly, and the pure honey of was famous all over the country. But now the moveable beehives have affected the Swat locally reared bees greatly. Now, the local good honey is found in remote areas only, while the honey of moveable hives is available everywhere in low prices. There is a large fishery in Madyan. In this fishery the trout fish are being reared. In Kohistan-e-Swat there are some private fisheries too. In Buner the fish were being reared in Barandu, Dagar. Moreover the Swat River serves as a permanent fishery throughout the year while the tributaries of it are used for fishing only in spring season. Mines' production plays an important role in the economy of a country, particularly in the regions where they exist, because, the local people get the opportunities to labor in, and earn their livelihood. But the Swati mines have no importance for the local people in this respect. It is necessary, however, to mention what they are, and where do they exist. Swat is rich in mineral wealth, but the discovered commodities are a few. Among them, the china clay stands first; others are marble stone, and emerald. The china clay exists at "Kathyar" in Nekpikheil (on the road that leads to Shahderai at a distance of 15 miles from Mingora). This is the largest mine, having the finest quality, of China clay in Pakistan. The clay is mined here, and is transported to Shaidu in Nawshehra (which is at a distance of around 100 miles from Swat). It is not so advantageous for the local people, because they have no opportunity to work in the complex. The mine of soap clay has been discovered recently between Alpurai and Kanra on the side of Gilgit Road (Shahrah-e-Resham). It is spread in a vast area. The marbles are dug near Charbagh, Murghuzar, and Barikot in the proper valley of Swat, and in Buner, it is mined in Thor Warsak, Bampokha, and Sawawai. Moreover, there is a great expectation of iron ores, which will be discovered in near future. The finest quality of emerald is produced in Swat. Its Color and transparency is unique. It is the best in world. It is exported to the international markets: There is an export potential of 500 million dollars in this sector, provided it is excavated and cut as per international standards. Before the absorption of Swat in Pakistan, the emeralds of Swat were better in quality, and greater in quantity. But since then it is said that the quantity of production is little, and the quality devalued. In Swat, all the former four elements are available in abundance, but unfortunately, the fifth item is totally absent, and Swat is intensely poor in political point of view. Therefore, we cannot find a single factory or mill installed by the government. A program for the installation of a "Match Factory" was made. The selected site for the factory was Manglor, but that program was canceled, and the factory shifted to somewhere else. Now the whole timber are smuggled out of the borders of Swat. The hides and skins are sent as raw materials to the tanneries outside Swat. China clay is transported to Shaidu Complex, a site 100 miles away from the border of Swat and 150 miles from the source. Only a refinery has been built in the vicinity of the mine. As the climatic conditions favor the silk factories, so, the Late Wali of Swat (may his soul be in peace) had permitted everyone to install tax-free silk factories, so that the local residents may earn their livelihood. Since then, the competition started, and in a span of time, the industrial area of Rahimabad, and Amankoat came into existence. The largest silk weaving mills planted in Hudigram. The small factories were set up in Mingora, Naway Kalay, Kabal and Bara Bandai. The number reached to more than 100. Unfortunately, Swat merged in Pakistan in 1969, and all the factories affected seriously, with the freshly arrived politics. The number of factories decreased to a few and the production dropped to zero. Now, many of the buildings are either evacuated halls without looms, or they have looms but no raw materials. Presently, the best democratic governments imposed cumbersome taxes, so the industrialists cannot run the factories, and hordes of labors became jobless. The handicrafts of Swat are very famous. When a tourist visits Swat, he accumulates bundles of these articles as gifts for his friends. All of the crafts prepared here are interesting, especially, the following are very charming. These blankets are known as "Sharai". They are prepared of wool obtained from the local sheep. The weight of a medium size blanket is four kilos. This is the best source of defense from the severity of winter. It is woven in Dewlai, Kala Kalay, Salampur, Puran, and Ghurband. These villages prepare the items on commercial scale. Shawl is a younger brother of Sharai, as it is also a woolen sheet, but light in weight. Sometimes, cotton is also mixed in its texture. It is beautifully fringed, and is commonly used by ladies. The tourists like it too much. Shawls are prepared in Salampur and Dewlai "Jolabad" on commercial bases. The next important thing, made of local fleece with laborious work, is rug. This is prepared in the villages by pressing wool with the help of water spray. After preparation, it is beautified with the usage of various colors. Rugs are the traditional carpets of shepherds, but now are used everywhere. The small girls can do the cotton thread, and golden lace work easily, but there is difficulty in silk thread work. In this work the threads of warp and woof of the cloth are counted, and with the help of calculation the work is carried on. As the young girls have no such maturity of mind, they cannot do this work. So for as the golden lace work is concerned, this is a twofold work; one type of the work is done with needle, while the other is done with owl. The needlework is carried on all over the Swat, especially in Nekpikheil, and Charbagh, but the owl embroidery is at Bara Bandai, and Koza Bandai (Nekpikheil). Among the prepared articles, sheets for bed covering, tablecloths, pillows, shirts, tea-cozy, and caps are famous. Knitting is the next hobby of the small girls of the villages. Panrey or Panrhey is the old fashion of shoes, still used by the old persons in Swat. They are made in Swat with the simply tanned leather. The cobblers have great skill in the formation of ladies shoes with golden lace work. Similarly, the sandals with golden lace work are also made. The cobblers of Shahderai had great skill in this field. It is now archaic. A Shkor is a pot in which chapatis (plate bread used in India and Pakistan) are kept. The ordinary Shkors are prepared everywhere in Swat, but a special design is made in Puran and Chagharzee (These Shkors are high-based pots made of wheat stalks with laborious art, not easily available in bazaar). Furniture of various styles is made in the district. The cots, tables, chairs, dressing tables, cradles of more advanced types, etc. are furnished in Mingora, and in nearly all large villages. The surplus amount of food grains stands first in the edible materials. The others are potatoes, tomatoes, pumpkins, garlic, and onion etc. Among the vegetables the largest elements of external trade are potatoes, turnip, and tomatoes. The other elements are exported on small scale. The fruits of various kinds including apples, oranges, apricots, damsons, pears, jujubes, and walnuts are also exported to nearly all big cities of Pakistan. Among the edible items, there are three other elements which are more precious than the above mentioned items. They are honey, indigenous butter oil, and mushroom. Honey and mushroom have much importance in the external trade. The physicians in the big cities of Pakistan want the honey. Hamdard Dawakhana demands more honey than any other. Mushrooms are the most precious fungicides, which are exported to many countries of the world. Its soup and taste is unique. Its price round about 3500 rupees per kg in the local market, and a 100$ in the international markets. Presently the annual export of mushroom from Swat is 70 million rupees. The population of Swat is round about 1,250,000. The distribution of population depends upon relief, climate vegetation, products, and industries. The people deserts the uneven surface composed of poor soil with severe climatic conditions, and seeks abode somewhere else in the area where the facilities for decent life are available. Therefore, in the early days, the exceeding number of population of mountainous areas were coming to the villages of the valley, and worked as peasants, or as helpers of the landlords. But now, the industrial and commercial centers avail them good opportunities for lucrative jobs, and fruitful labor work. So instead of the villages, the influx of the population is toward the cities. Thus Mingora is the thickly populated area in the whole Swat. The villages of the valley have thicker population as compared to the mountainous areas. The population of Swat consists of the following main races: Mian, Mula, Swati Dalazak, Pukhtoon, Kohistani, and Gujar. Each of them has their own genealogy, and background. Mian means reverend, so, all the Miangan are respected for their pious origin, forefathers, but they are not descended from one progenitor. They have come from different origins, hence they are known with various names i.e. Sayed, Papinee, Akhund Kheil, and Madey Kheil etc. Among them, Sayeds are very respected, and their genealogy is linked to the Holy Prophet (Peace be Upon him). Sayed Qamar Ali Shah, known as Peer Baba, whose tomb is in Buner which is attended by thousands of people each year, is their nearer forefather. A Mula is a religious scholar. The whole family of a Mula is also named after him. Like Miangan, Mulan are also reverend sect. Again, like Miangan, they are not from one source. There are various groups in them like Mula, Sahibzada, Sheikh, and Akhunzada etc. Muslim conquerors also brought Mulans with them, to preach Islam in the newly occupied regions. Later on these Mulans were settled permanently in these areas. Many other races like Pukhtoon, Mian, Gujar etc. also turned as Mulan, and so, their origin was concealed by the thick cover of knowledge and wisdom. Both Mulan, and Miangan, are known as "Stanadar" Stana means residence, and Dar means holder. Thus, Stanadar means the permanent Master of Abode. They were called so, because in the case of departure, or attack, other people would deposit their precious materials in the houses of Stanadar (Miangan and Mulan), as the invaders would not touch them. The assailants also respected Stanadar, and never touched, or harmed the things that were entrusted to Stanadars. Secondly, before 1924(the year of permanent allotment), other people would change their villages at the end of each decade, but Stanadars would stay in their villages permanently. This race is belonging to Yousafzai tribe. Though, there are some Mandan, Swati and Shalmani too, but their number is very little. The majority of the population of Swat is Yousafzai. This tribe is further subdivided into many offshoots, and each branch is called by its nearer forefathers' name, as the children of Usman are Usmankhail, and from Janakay is Jankikhail, and so on. Kohistani appear to be the indigenous population of Swat. When Mahmood conquered Swat, he had no time to explore the cone, and corners of Swat, so, the mountain-enclosed valleys were not invaded. Islam spread, slowly and gradually, in these areas. These people are now called as Kohistani. Kohistani can also be divided into many tribes. The population of both Abasin Kohistan and Kohistan-e-Swat has many offshoots. Proper Gujars, who keep buffaloes and cows. Ajar, who are also Gujar but keep sheep and goats. They are called Ajars, because they are seasonal migrators. This division occurs for their professions, both are the same race otherwise. However, the chief tribe of Gujars is Kattaan, and that of Ajars is Balaisar. Now all of these races have become an integral part of Yousafzai. Pukhto (Pashto) is the main language spoken, and known, everywhere in Swat. Besides this, there are three other languages too: Kohistani Language spoken in Abasin Kohistan, Kohistani Language spoken in Kohistan-e-Swat, and Gujro (spoken by Ajars, and Gujars). Gujro is a language like Punjabi mixed with Pukhto. All of the residents of Swat are strictly devoted to Islam. A Swati can tolerate the worst challenge to his life, but cannot bear a challenge to Islam. To speak against Islam in the presence of a Swati, is a call-for-death. Though, they do not offer their prayers regularly, but they are very punctual to keep fasts. They end terms with, and, if possible, beat, a so-called Muslim who does not keep fast. Due to the lack of religious knowledge, they are superstitious, and have assumed some customs as parts of the religion. But they are far better in belief than the other parts of Pakistan. It is hopped that they will be reformed within a short period, because the torches of knowledge and the beacons of education are seen in the new generation. The education, will, certainly refine their ways and beliefs and happiness and prosperity will prevail in the society. Firstly in Swati Society, Talaq (Divorce) is regarded as the most mean commitment. So, the rate of divorce is very low here. A man who divorces his wife is contemptible one. There is no worst abuse in Swat, than to call someone "Talaqi" - A man who has dovorced his wife. Secondly, though the landscape and other natural environment of Swat is romantic, but love marriage is out of the etiquette of Swati Society. The people are very relifious and live in Pardah (veil). So, boys and girls are not disturbed by love. The boys are so shameful that on the days of marriages, the poor shying bridegrooms leave homes and come back at midnight so that no one may see them. Some twenty years earlier the would come to their homes at least one week later, as they had been married. Thirdly, dance is enjoyed too much in other societies and is regarded as their cultural trait, but Swati people hate dance. The professional dancers and musicians are thought to be the lowest and meanest creatures of the society. However, the amateur musicians are exempted.